•READY TO GO RIGHT OUT OF THE BOX: Stands 33 inches tall, 7 inches wide and 2 1/2 inches deep and comes complete with a rechargeable Ni-MH battery and solar recharging unit. •COLORFUL : Brightly colored and intricately hand painted and includes a rugged metal yard stake. 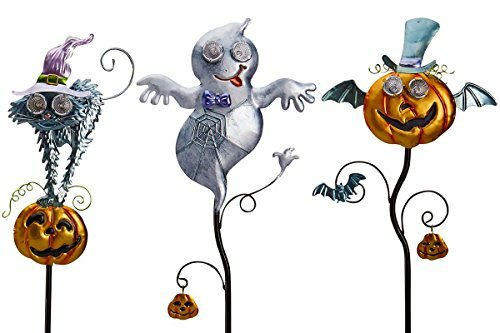 •DURABLE ALL METAL CONSTRUCTION: The bright eyes of the Goblin Guiders glow brightly in the Halloween night. DURABLE ALL METAL CONSTRUCTION: The Goblin Guiders have super bright, light solar powered eyes and a durable, all metal body. COLORFUL : Brightly colored and intricately hand painted and includes a rugged metal yard stake. READY TO GO RIGHT OUT OF THE BOX: Stands 33 inches tall, 7 inches wide and 2 1/2 inches deep and comes complete with a rechargeable Ni-MH battery and solar recharging unit. If you have any questions about this product by Original Treasures, contact us by completing and submitting the form below. If you are looking for a specif part number, please include it with your message.